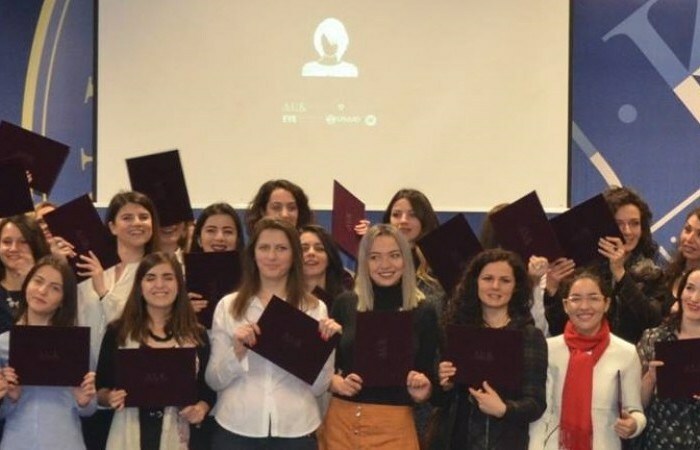 In order to tackle the gender divide in the ICT profession in Kosovo, A.U.K Training and Development Institute initiated the pilot project Female in IT (FIT) back in 2014. The project was co-supported by RIT Kosovo (A.U.K), Helvetas Swiss Intercooperation (through EYE Project), USAID‘s Empower Private Sector and IPKO Foundation. As part of the project, 70 young females have been trained in three distinct job profiles: Desktop Support Technician, System & Network Administrator and Software & Application Developer. Despite the ICT training curriculum, the participants had the opportunity to attend English language and Soft Skills training through which they further strengthened their communication, writing and presentation skills. Apart from the 500+ contact hour curriculum, with the help of donors and IPKO Foundation, A.U.K TDI organized the first ever Girls in ICT International Day back in 2015 and continued the tradition with a second conference to mark this international day in 2016. Specifically in the last event, IPKO Foundation’s contribution and dedication was impeccable as it helped the team organize a one day event full of colorful activities for 200+ participants. FIT Project entailed much more than the professional advancement of the participants. It aimed to diminish the gender divide in the ICT sector by easing the transition into the labor market for females as well as by inducing a new social paradigm about the ICT profession in general. Both these goals have been accomplished as more than 70% of the participants are already employed in the sector and more and more institutions/organizations are further contributing to the cause. A.U.K TDI thanks the donors of the project and IPKO Foundation for their support. The project would not have been to succeed without them.